Congrats Diana Kraskouskaya MNP Award Winner 2018! 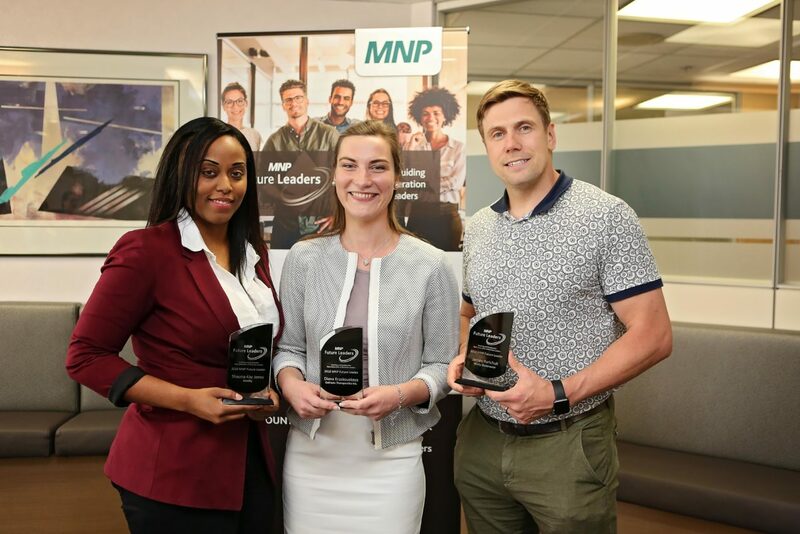 Meet the 2018 MNP Future Leaders! Congratulations to Diana Kraskouskaya (Center) of Dalriada Therapeutics Inc., Shauna-Kay Jones of Motify, and James Yurichuk of Wully Outerwear as they embark on a year of mentorship. MNP works with communities to build a better future by supporting young business leaders of today. ICUBE would like to give a special shoutout and congratulations to UTM’s Diana Kraskouskaya, way to go! As the CEO of Dalriada Therapeutics Inc., Diana is innovating by developing small molecule-based technologies that battle diseases for which there is no treatment. In 2017 Diana and Dalriada won the $25,000 RBC Prize as part of UofT Entrepreneurship Week Startup Showcase, in which over 60 teams pitched their startups (Read about it here). Diana also serves as a research associate for Gunning Group and is an active member of UTM’s community. Find out more about Dalriada Therapeutics, Diana Kraskouskaya, and Gunning Group.